My head was still reeling from the effects of 1984 so by way of "cleansing the palate", I decided to pick up an easy, fun, and light read. A quick glance at the books lined up in my office cubicle yielded positive results: my gaze fell upon my signed copy of No Strings Attached by Filipina author (and fellow mommy!) Mina V. Esguerra, which copy was given by a fellow Goodreads member, Tina, in July last year. So, remembering that I made a (new year's reading) resolution to read more local books, and knowing that some chick-lit would just be perfect for the purpose of, um, purging the after-effects of 1984, I went ahead and read this novella. Twenty-nine-year-old-turning-thirty-in-a-couple-of-months Carla Alejandro is the perfect assistant: efficient, practical, and a hard worker. I deduced that she's a pretty thing, she has money to spend when she wants to, she has gym membership, and of course, she's a smart lady. Her only fault (?) however, is she's single, and that's a huge problem where she is concerned because (1) she's turning 30, and (2) all of her closest girl friends are married and have thus become members of the Marriage Club, making her feel left out when they start discussing babies, diapers, and husbands. So, her best friend Mary consistently fixes her up with banker-type guys, and her guy best friend, Tonio, keeps telling her to relax and hook up with guys, sans commitment. Until she meets Dante - the Dante, who seems just about perfect, except for one teeny, little thing: he's 5 years younger than Carla. Uh-oh. To reiterate, I had been looking for a light, fun and quick read when I picked up this book - and I wasn't disappointed. No Strings Attached was all that: an easy, fun read that I managed to finish it in one sitting (in the office, but don't tell my boss, ssshhh!). I was desperate to be entertained, and entertained I definitely was. I didn't even mind that I couldn't relate to Carla, because (1) I am 2 years past her dreaded age, which I didn't dread the way she did when it happened to me 2 years ago; (2) I never had friends who fixed me up on blind dates because they felt I couldn't get one for myself, or am making a mistake with those I did date, and (3) I am at the other end of the spectrum - I belong to the Marriage Club now and can relate more to Carla's friends. While my husband is admittedly younger than me - by just 3 months, which is negligible - age was never an issue for me when it comes to relationships. Look at the (now-divorced) Ashton Kutcher and Demi Moore. No one accused her of being a cradlesnatcher when they started dating, right? That's because age is not a big deal. I mean, it should never be, yes? Notwithstanding my incredulity at the blown-out-of-proportion age disparity between Carla and Dante, however, I was still able to recognize familiar scenes and situations that made me smile, conjuring up the memories. For, I did date, too, once upon a time, and have had my share of relationship issues as well. 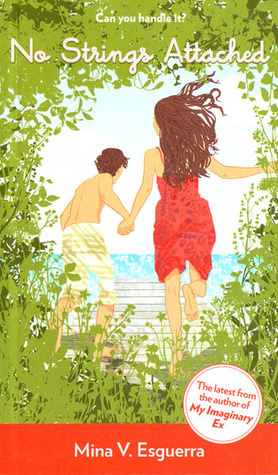 So, for the trip down memory lane, and for its entertainment and kilig value, I appreciate this novella, truly.